The Raster™ Pen Braille insertion device is an option for all our CNC routers and for our 16 Series and 24 Series engravers. Vision-Pro software includes Braille fonts and is fully compatible with the Raster™ Method. The Raster™ Pen Braille insertion device is an option for all our CNC routers and for our 16 Series and 24 Series engravers. 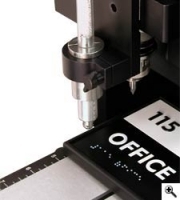 Vision-Pro software includes Braille fonts and is fully compatible with the Raster™ Method. Vision CNC machines allow precise placement of the Rasters™ (Braille beads), which are essential for shops producing ADA-compliant signage. The Raster™ Method of Braille insertion and Raster™ Pen are licensed, patented products owned by Accent Signage Systems, Inc. Minneapolis, MN.